There was something odd about the way the South Korean female skaters performed in the 500-meter team pursuit quarterfinals event at PyeongChang on Monday. The three-member team -- Kim Bo-reum, Noh Seon-yeong and Park Ji-woo -- looked almost as if they were competing in an individual race, not a team pursuit. 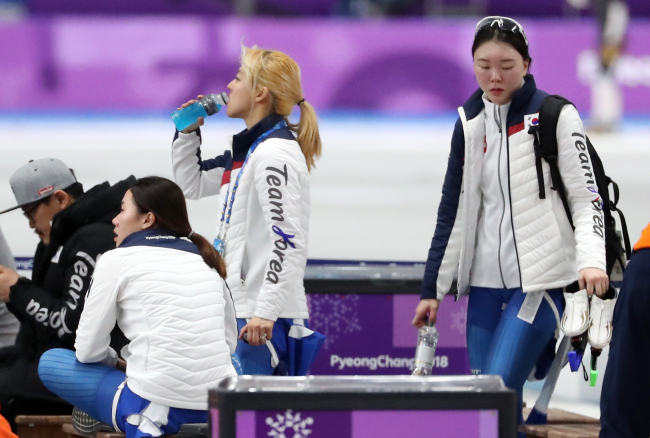 When Noh Seon-yeong, one of the team members, fell a long way behind during the race, the remaining two skaters -- Park and Kim -- left her behind and crossed the finish line without her. Noh, who couldn’t manage to narrow the gap, came in almost four seconds after her teammates. 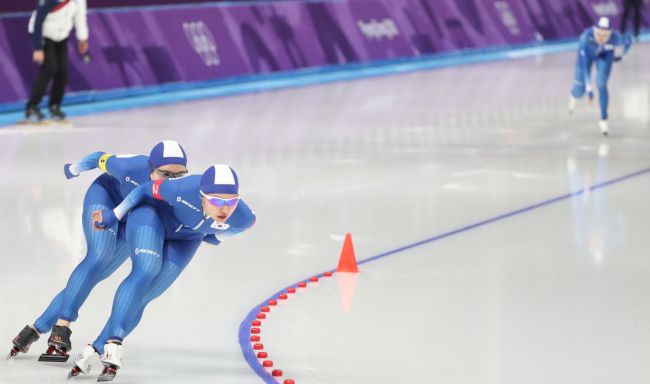 As the rankings in team pursuit events are decided on the time the third skater in each team crosses the finish line, leaving Noh by herself seemed like a strange decision for many watchers. 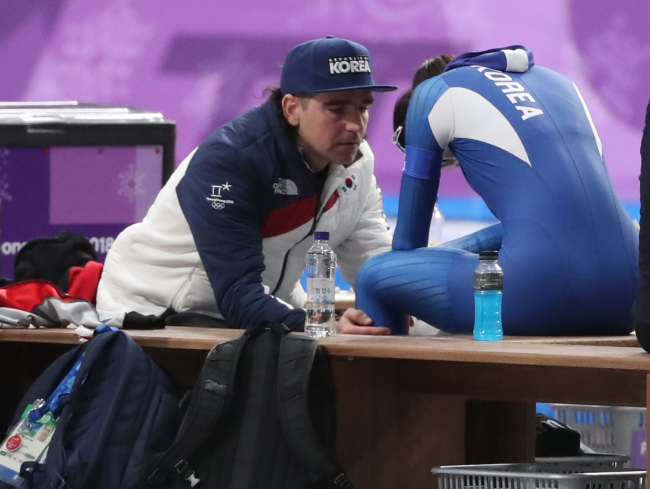 South Korean speedskater Noh Seon-yeong is being comforted by her coach Bob De Jong after finishing seventh at the 500-meter women`s team pursuit quarterfinals event at PyeongChang, Gangwon Province, on Monday. It is speculated that she had been bullied by her teammates (Yonhap). Unsurprisingly, the Korean team failed to advance to the semifinals, finishing seventh. But what looked like an unusual move soon triggered a storm of online speculation about bullying, leading angry fans to sign a petition asking the presidential office to expel Park and Kim from the South Korean Olympic team. As of Tuesday afternoon, some 222,000 people had signed the petition against the Park and Kim’s purported bullying. The speedskating pursuit resembles team pursuit in cycling. The three skaters are supposed to “swing their arms in unison,” “nestled in behind each other,” and “switch out their positioning on lap turns, each taking their spot out front,” according to a description in the Toronto Star. “What the South Korean team showed during the race was the exact opposite of what a team pursuit skating event should be,” said Kim Byung-jin, a 32-year-old sports fan. Skaters in a team pursuit usually follow each other close in line, drafting to minimize total drag. It’s the lead skater who needs to work the hardest, as she has to fight the drag caused by air resistance. During the race, Noh fell behind her teammates after switching in position from being the lead skater to third, suggesting she might have already spent a lot of her strength by that point. What triggered the petition and public backlash was skater Kim Bo-reum’s comments broadcast on live television following the controversial race. Many felt that Kim was indirectly blaming Noh for their results. “I think we were skating well,” she told a reporter, and then sniggered. 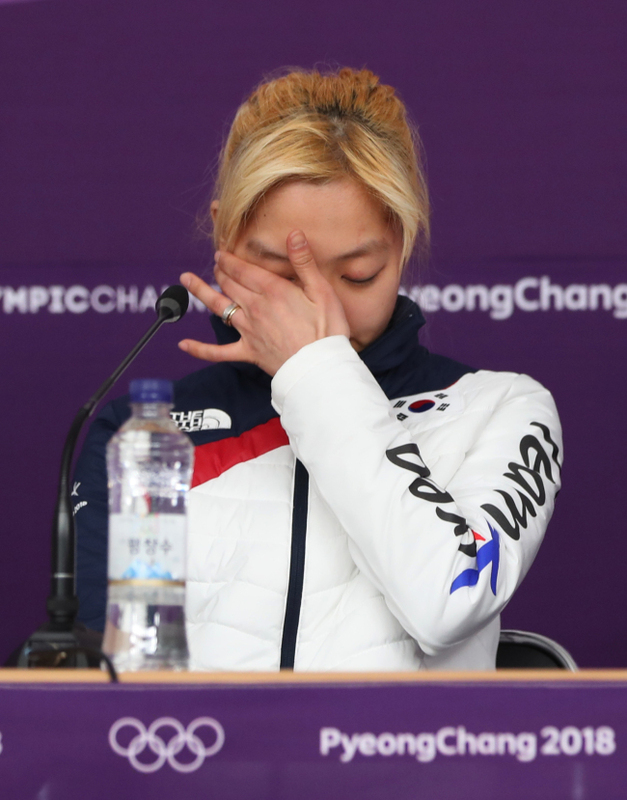 Many accused Park of lying, saying there is no way for skaters in a team pursuit event to not realize when their teammates are falling behind, as they are supposed to follow each other closely. Critics also said that Kim showed no respect for Noh, Olympic viewers and the team pursuit as a sport itself. “What makes me angry is that Kim seemed to think that people are ignorant about the team pursuit event, and that people would fall for her comments during that interview -- that her team had a low score because Noh was not as good as Park and herself,” said Jang Ji-hyung, a 28-year-old office worker in Seoul. “Perhaps that is true. But what’s also true is that she and Park did not have any reason to skate so hard after Noh fell behind, as this was a team sport and the ranking was going to be decided upon the time that the third skater crosses the finish line,” Jang said. TV footage also showed Noh sobbing after the race, being comforted only by her coach Bob De Jong. Kim and Park appeared to do nothing while Noh was crying. Noh declined to give any interviews following the race. After receiving a flurry of angry posts and comments, Kim switched her social media accounts to private. 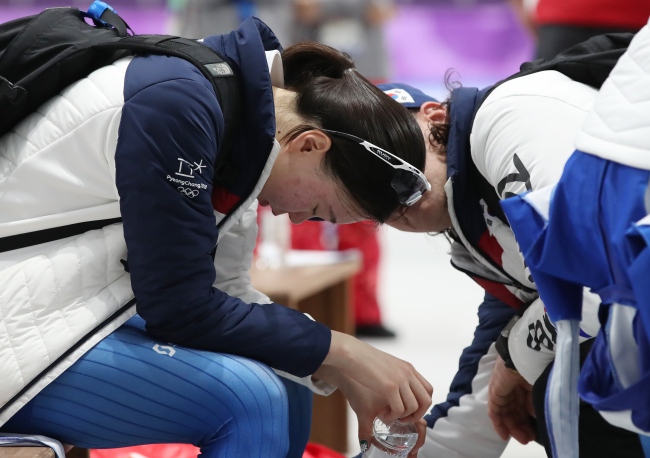 Prior to the race, Noh had a tough journey in trying to compete at PyeongChang. The skater almost missed her spot at the games due to a mix-up by South Korea’s skating union. She only became eligible again after two Russian skaters did not make the final cut. Noh is also the older sister of late short track speedskater Noh Jin-kyu. The late Noh had initially been selected to represent South Korea for the 2014 Sochi Olympics, but was diagnosed with bone cancer following an injury while training in the same year. He was unable to compete at Sochi, and died two years later in 2016. Noh had accused the skating union of ignoring her late brother’s ill health and great pain in order to “gain a gold medal through him.” The late skater had been considered one of South Korea’s best bets to earn gold at Sochi at the time. It had been previously announced that all of the three skaters would also attend the press event, but only Kim showed up. The coach said Noh was not feeling well, while Park had been severely affected by the mounting criticism. Baek claimed that it was Noh’s idea to be the third skater in the later portion of the race. “But it was my mistake to accept the idea and decide to go with it,” he added. Skater Kim also offered her apology in tears. “I apologize to those who have been affected by what I said during the TV interview yesterday,” she said. Not many felt Baek‘s apology had much substance. “Even Baek’s ‘apology’ blames Noh,” said a Twitter user.